WASHINGTON — The week-long battle between the Philippine government forces and a breakaway Muslim guerrilla group has come to a quick end. 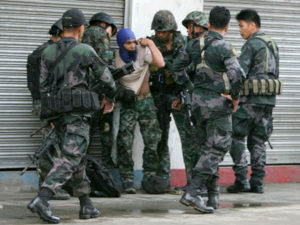 Reuters reported that the Philippine forces pushed out rebel Muslim guerrillas, who broke away from the main Muslim contingent of the Moro National Liberation Front (MNLF). Up to 100 people have been killed in the fighting, which was focused int he southern port city of Zamboanga this past week. The fighting highlighted how some Muslims do not agree with the peace accord signed between the government and the MNLF last October, ending 40 years of war. The rebels fled with several hostages, including the city police chief and several of his police officers. The Philippines is a majority Catholic country, and the Muslim guerrilla forces are concentrated in the southern islands.